Rewards cards allow you to earn cash back or other incentives just for using your credit card. Smart shoppers know how to maximize their rewards by using their credit card for their every day spending and monthly bill payments. However, have you taken the time to consider if you can get even more out of these programs? Over the years, I have done a lot of experimentation and I have some tips to help you get the most from your rewards cards. By using these tips you can maximize earnings from your rewards cards and put more money in your wallet or take your dream vacation even faster. What Type of Rewards Card Do You Need? If you want to maximize the rewards from your credit card you need to identify which reward credit cards best fit with your spending habits. It doesn’t make sense to pay $150 per year to use a top travel credit card when your monthly spending doesn’t earn you enough points to cover the fees. Similarly, if you are spending more than $5,000 every month on your credit card, you might be limiting your rewards by using a basic, no fee rewards card. No fee reward credit cards do exist, and there are some decent options out there. One of the top no fee reward credit cards is the Capital One Venture One Rewards Credit Card, where you earn 1.25 miles per dollar on every purchase you make. Another good no fee option is Capital One Cash, where members earn 1% cash back on every dollar spent. These reward credit cards are fine if you don’t spend more than $2,500/month on your credit card and like to keep things simple for earning and redeeming points. Keep in mind that you are usually earning 1% or less with these no fee, basic rewards cards. 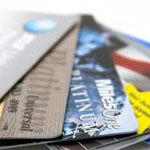 Travel rewards credit cards are the most popular type of rewards cards in North America. There are currently hundreds of travel rewards credit cards available to North Americans, consisting of airline rewards cards, hotel rewards cards and more broadly defined travel credit cards, such as Air Miles rewards. There are a few no annual fee options for travel rewards credit cards, but to truly maximize your rewards shoppers need to consider cards with an annual fee. The Capital One Venture Rewards Credit Card has a $59 annual fee but offers 2 travel miles for every dollar spent, meaning that if you spent $5,000 each month on your credit card you could be earning $1,250 in travel rewards every year. Travel reward credit cards are great for people who like to save up their rewards and redeem them for a free holiday every year or two. If you enjoy travelling and can spend over $3,000 each month on your credit card, consider a travel rewards card. Some people prefer earning cold-hard cash back from their rewards cards. It feels good to put a bit of cash back in your wallet simply by using your credit card for every day spending. As with the other reward credit cards mentioned earlier, there are no annual fee options that give you around 1% cash back, or you can select a more generous cash back rewards card with an annual fee. If you spend less than $2,500/month the Chase Freedom Visa is a great option that gives you up to 5% cash back on purchases within the selected categories (up to $1,500 each month) and 1% on everything else. If you are a big spender then you might want to shell out the $75 annual fee to get the Blue Cash Preferred from American Express, which gives you 6% cash back on groceries, 3% cash back on gas, and 1% cash back on all other spending. The quickest way to maximize your rewards is to double dip by using a loyalty program like airline frequent flyer miles, hotel rewards or grocery rewards. Again, to determine the best loyalty card for you, consider where you do the majority of your shopping. Remember that if you are carrying a balance on your credit card you are trading a 1 or 2% rebate for 19% credit card interest rate. That means your rewards cards are costing you money. Not a good deal. Remember to match your reward credit cards to your shopping needs, and then use that card for all your daily spending, from groceries and gas, to monthly bill payments. If you spend less than $2,500 each month on your credit card then stick to the no annual fee, basic credit card options. But if you use your credit card regularly for travel or for business and want your rewards to go even further, consider an annual fee travel rewards or cash back credit card. What are some of the ways you maximize earnings on your rewards cards? What card do you recommend? Robb Engen blogs about personal finance at Boomer & Echo. Together with his mom, (she’s the Boomer, he’s the Echo) they offer their own unique perspectives on saving, investing and personal finance. Add Boomer & Echo to your RSS reader today! I like the travel rewards cards anf use the miles to travel overseas.